Carved elongated (lengthened) decorative onlays for furniture elements. 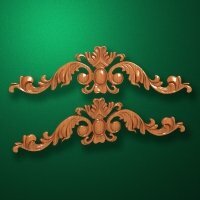 Carved onlays for decorating of architecture elements and interior items. Wooden and MDF onlays.